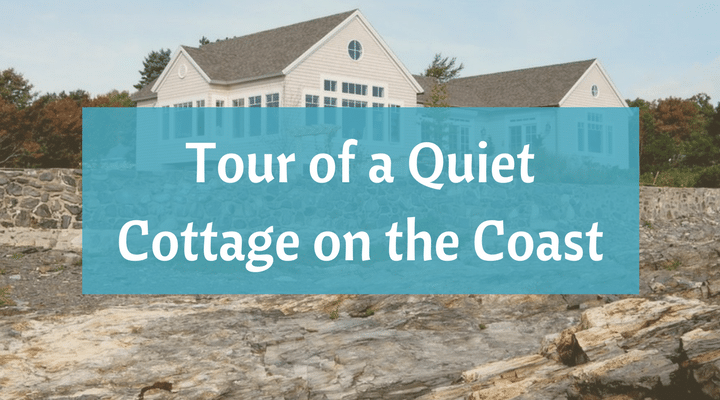 This coastal cottage is perched just a bit above the ocean that has carved out the rugged Maine coastline. 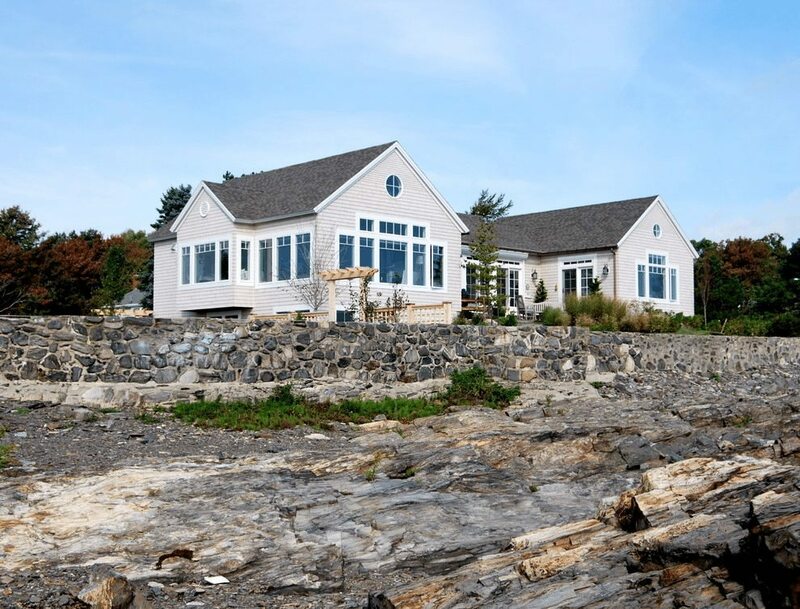 The interior is a haven where the residents watch the ocean in its dark fierceness and in its sunny brilliance. With the three-sided view of the natural splendor that surrounds the home, there is no mistaking the primary element of the décor. The subdued colors and uncomplicated furnishings, as lovely as they are, defer to the artistry framed by the windows. In the great room, there are two walls of windows, and we are immediately captivated by the view. 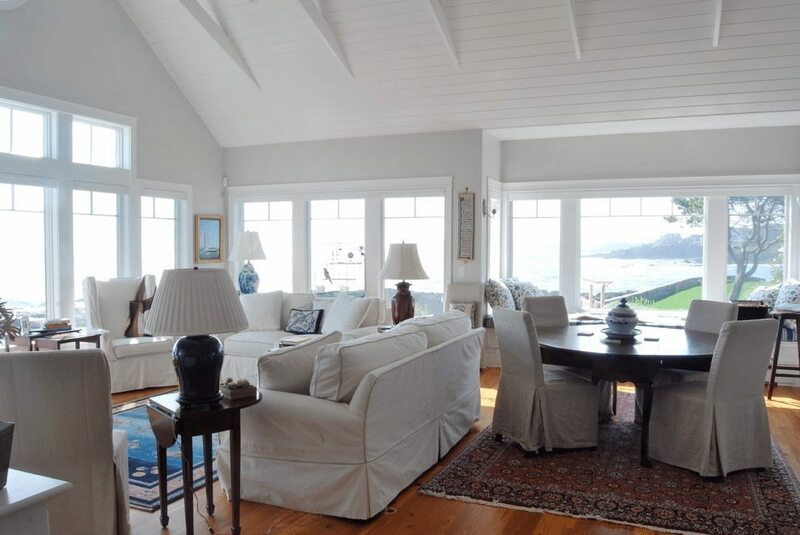 There are no window dressings to detract from it nor to limit the natural light that fills the room. 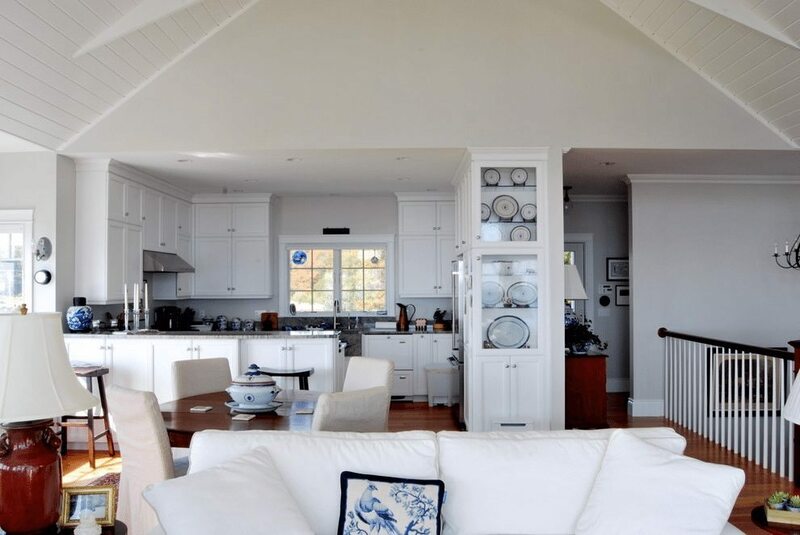 The living and dining areas are arranged in such a way that each has its own space while remaining part of the whole. The box-edge slipcovers and draped dining chairs are an almost-white gray, and the walls are just a tad deeper. The overall first impression is of an all-white room, but the gray tinge is softer and easier on the eyes, particularly in bright sunlight. The use of color accents is exquisitely restrained, such as the dark wood of the dining table picked up in the two lamps and small end tables in the living area. At the left end of the living area, there is a section that can be used as a private sitting area that is made more intimate with the inclusion of the fireplace and the shelves of commemorative plates interspersed with personal photographs. 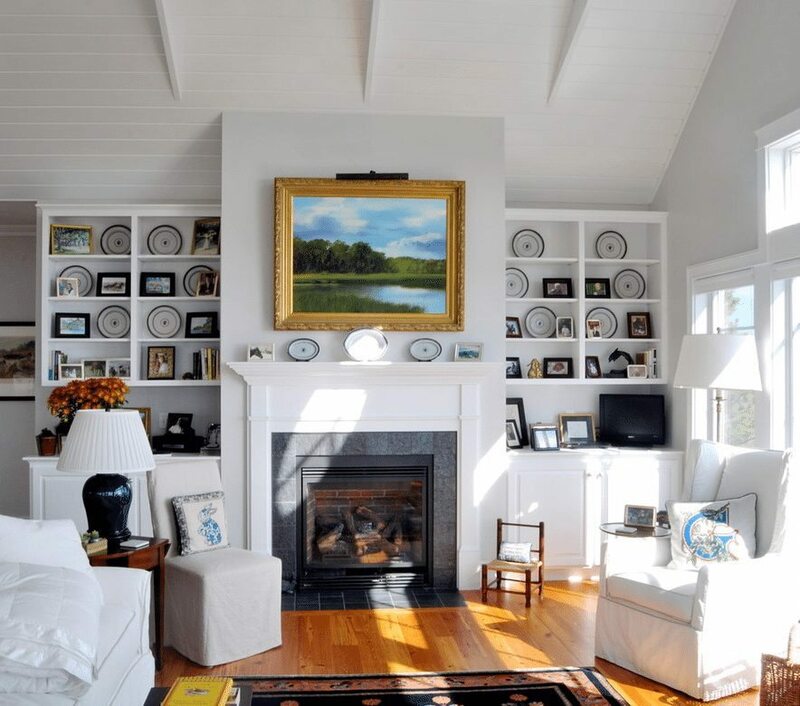 The painting over the fireplace, appearing at first as a random use of bright color, is actually balanced by a painting at the other end of the living area. The kitchen is convenient without being intrusive. The retro kitchen cabinets echo the “boxy” style of the dining chairs and slipcovers. My favorite feature here is the china cabinet, part of the wall that surrounds the refrigerator. 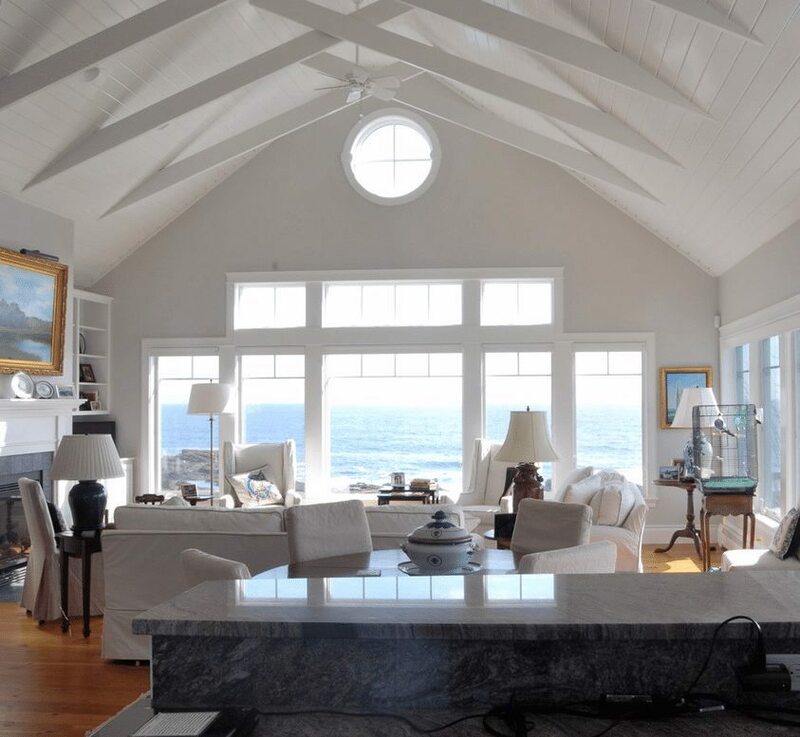 From this vantage point, you have a complete view of the décor of the great room, and the importance of the ocean and sky to the design is abundantly evident. Notice the two paintings at opposite ends of the living area that I mentioned before. Picture one without the other, and you’ll see what each contributes to the balance of the overall design of the room. 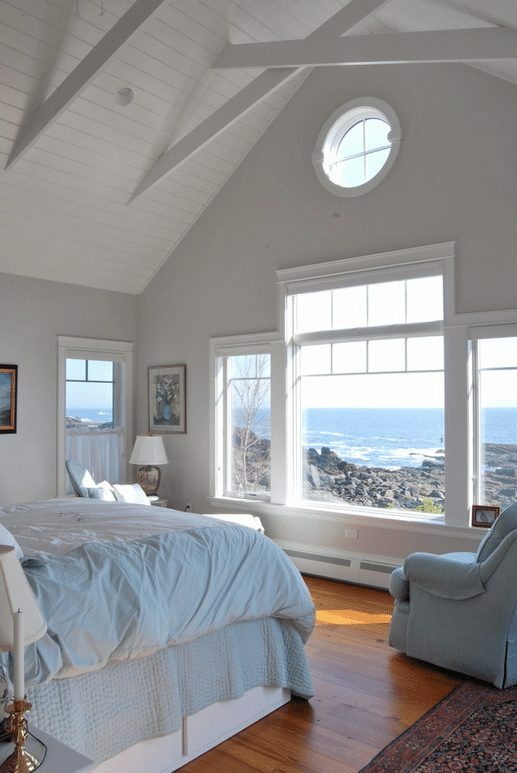 The colors in the master bedroom are also subdued, but now the tinge is blue, as though the colors of the ocean and water are streaming through the window. The porthole window remains from the original house, a “keepsake” from the house’s previous life as a waterman’s rustic home. The shelving in the guest room makes a partial nook for the bed. It looks cozy. The fabrics used on the bed, with their notes of periwinkle, recall long ago summer memories of crisp fresh cotton crinkle and pique. This small bathroom was transformed into a luxurious spa. 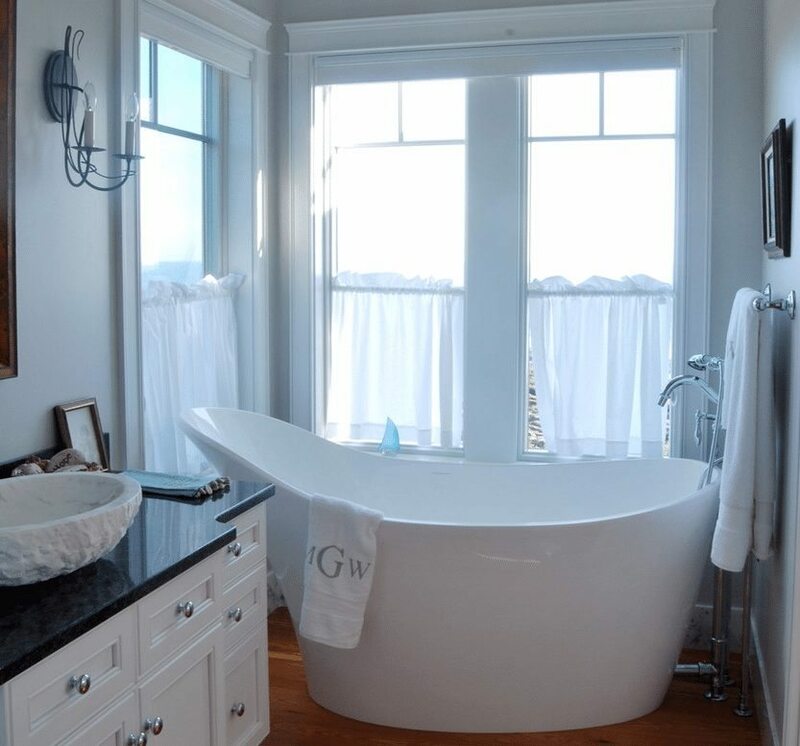 The slipper tub is a modern, ergonomic rendition of a Victorian tub. And it’s made of acrylic—no more shocks of porcelain cold in the winter. A clever and effective companion to the tub is the travertine and limestone vessel sink, a throwback to Victorian washbowls and yet the current “rage” in bathroom décor. This house is rustic yet elegant, simple yet sophisticated. It demonstrates the ways in which little color is enough color, as long as there are colorful accents artfully placed. The most amazing thing about the décor is how the natural surroundings were used as an element of the design.